During our recent visit to the Dortmund Inter-tabac trade show, we met with Savinelli (of course). Part of our chat included the success of the Savinelli Dry System pipe. 1. The large smokehole on the top of the mouthpiece of theSavinelli Dry System allows the smoke to leave in an even spread, and not directly onto the tongue; its size makes it easy to clean and spreads the flavour in the mouth. Its position makes it difficult for juices to enter the stem from the mouth. 6. It has a built-in moisture trap. However, the development of the Savinelli Dry System was not an accident. The objective of Savinelli (as with any good pipe manufacturer) is to produce a briar pipe that will give a “cool, dry smoke”. 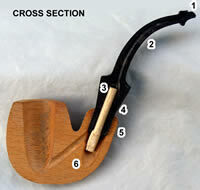 The aesthetics, beauty of grain, feel and balance are all irrelevant if the pipe does not meet this basic objective. How do you go about this in the manufacture of briar pipes? First of all the briar needs to be cleaned of oils and sap by boiling. Then the block (ebauchon) needs to be made porous by drying. These processes alone can take many months. Yet with the advent of the “aromatic” tobaccos many years ago, these procedures were not sufficient as the smoke carried excessive oils from the bowl. Assistance was sought from the engineering industry and the Byford, Falcon and Keyser pipes arrived on the market – effective, but messy. And in the early 1900s, Kapp & Peterson developed a System pipe – considered at that time, and for many years, to be the perfect system. When Savinelli wanted to introduce a specialised dry smoking pipe into their range, they looked at the original Peterson. They looked carefully - how and where could they improve on it, no point in simply copying it. The Savinelli Dry System design evolved over many years (it took 4 years for Savinelli to develop the mouthpiece alone), and much thought went into it: including in-depth research into the negative points of existing system pipes, in order to improve on them; considering the balance (only certain shapes would be suitable); the technical side (taking into account the engineering possibilities); the materials for mouthpiece and band; the aesthetics. 3. they changed the mouthpiece from a tapered fitting to a peg fitting which does not twist off in the pocket or pouch, causing a nasty mess. Savinelli labelled this design the “Dry System” and we think that this is technically the best designed pipe on the market. The name "Dry" comes from the introduction of the balsa "filter" into the traditional system pipe - the "System" being the presence of the built-in moisture trap in the shank, linked with the "smokehole-on-the-top" mouthpiece. The Savinelli Dry System pipe has only one removable part, the balsa insert, and if this is missing the system will still work, with no harm to the pipe or to the quality of the smoke. It will still be clean and dry. Launched in 1981, the Savinelli Dry System pipe is, in our opinion, the best answer so far developed to the problem of "Wet Smoking". Put this all together and you can see why we say these are technically our best designed pipes. extra bonuses are the Savinelli quality, the feel, the finishes and the balance.